My family has just returned from an excellent week in Casa Troy. We were a party of eight adults, three small children and a baby. The layout of the property worked really well; we all had plenty of space and it was safe for the children as both short flights of stairs had gates. The children loved the pool and the adults enjoyed having the pool table and hot tub available. Ali and Lee were fantastic at answering queries and sorting them out. The location was good as we could walk to the beach and down to the centre of the town. We had a great week in Casa Troy with our family of 8 adult and 5 children from 9 till 1 years old. A lot of privacy for everyone. Great pool, whirlpool and pooltable, enjoyed very much. Great big table outside, where the familylive was all around. The house was clean and there was room enough for everybody. We can recommend the house. Fine island, plenty to see and do. For Dutch, it is a big loss if there is no coffee maker. And I have missed more large pans and oven trays in the kitchen. Despite that we managed to cook for 13 people. So it does works anyway. We had a great time in casa troy. The villa is spacious, well equipped and very comfortable. Ali was a pleasure to deal with and the welcome pack was great especially with the kids, meant we didn't have to run out to the shops. The supermarket is only a 5 min walk away and old town about 10 minutes and 15 to the main strip. The walk back up the hill in the heat is tough but taxis are less than 4 euro. This was our first ever villa holiday, and was made up of a group of 12 with ages ranging from 13 to 70. The first thing I should mention is how patient and helpful Alison was with me whilst I blundered my way through the initial booking of the villa using the website. She was very helpful explaining all the costs along the way. Upon arrival we were met both Lee and Ali who gave us a quick tour and gave demonstrations on how to operate everything from the pool cover to the TV (Just as well as there's so many channels and movies available we would have probably spent all week trying to decide what to watch haha). There was a welcome pack left in the fridge for us which included water, milk, bread, ham, cheese and more essential items such as beer and wine. Absolutely perfect! During our stay we found the villa to be perfectly located, walking distance from both the old town and the strip, with bus stops near by where you could get pretty much anywhere from. We found it best to use taxis to get back to the villa from either the strip or the old town, as the hill back up is a touch steep and the taxis are extremely cheap. 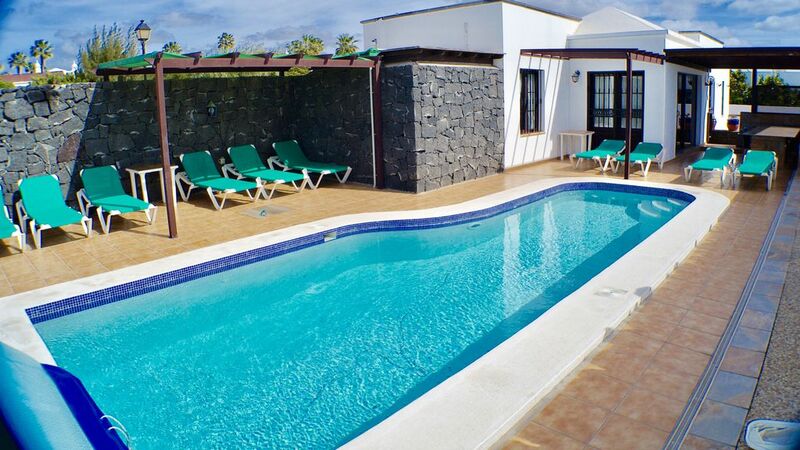 The villa is very well equipped and had also just had fibre optic broadband fitted prior to our arrival. The pool is a great size and stays at a good temperature. Lee cleans both the pool and hot tub every second day. The villa was spacious enough for the 12 of us never to feel on top of each other, yet when everyone was together it worked well, especially when dining outside. All in all, we had a great week, and would thoroughly recommend the villa to anyone. It has changed us from a family who has always 'done' package holidays to a family that is likely not to book anything other than villas in the future. Arrived at Casa Troy to a lovely welcome of beers, wine, water and some food to get us through until a visit to the shops which was a lovely surprise. The villa is in fantastic condition and more than enough room for us all to have our own space. Great pool and space for sunbathing, pool table and hot tub. Location was brilliant. Close to shops and restaurants and a short walk to the harbour. We really can’t compliment the hosts enough and would definitely recommend to anyone.